AOA (Ace of Angels – 에이오에이) currently consists of 6 members. They debuted on August 9, 2012, under FNC Entertainment. – She has been interested in music since she was young. – She suffered from Carpal Tunnel syndrome and underwent surgery in the past. – She has been a fan of previous 2PM member Jay Park ever since high school. – Her yellow guitar (which she named Banana) is apparently Juniel’s guitar’s (named Panini) sister. – In 2011, her mom gave her a guitar (named Mimi) as a birthday gift. – She placed fourth on Unpretty Rapstar season 1. – She went to Chinese language school for 2 years. – She can play the guitar, the harmonica, and the piano. – Jimin raps even in sleep. – After ChoA’s departure, Seolhyun and Jimin have left the dorm. Jimin lives alone. – She appeared in the drama “Click your heart” (2016). – Her younger sister Yu-ri made her debut in 2014 with the girl group Berry Good, under the stage name “Seoyul”. – She plays piano since she was 7 years old. – She went to Seoul from Busan alone, after getting consent from her parents. She stayed at her uncle’s, practiced singing and went to auditions. – She can play the keyboard. – Her favorite type of music is ballads. – She played the lead in the Japanese musical “Summer Snow”. – She acted in a few web-dramas and dramas: “Hot and Sweet” (2016), “My Old Friend” (2016), “Single Wife” (2017). – She’s an only child. – It is said that she was very shy as a child, and is still shy today, but is more open and talkative once you get to know her. – She became more confident after she became a cheerleader and a promotional model in high school. – Hyejeong’s mom signed her up for a supermodel pageant where Hyejeong succeeded at up until the third preliminary round. However, during that contest she was discovered by FNC Entertainment’s casting director, so she joined the company as a trainee (in August 2010). – She acted in SBS drama ‘A Gentleman’s Dignity’ prior to AOA’s debut. – She acted in SBS’s drama “Cheongdam-dong Alice” (as Se Kyung’s younger sister Se Jin). – She was one of the cast members on the first season of The Romantic & Idol, she paired up with MBLAQ’s Mir and 2PM’s Jun.K on the show. – She enjoys doing yoga. – She is good at cooking Kimchi. – She and Seolhyun eat the most out of the AOA members. – She prefers to stay simple by wearing a hoodie and some shorts, rather than dressing up. – According to the other members, she has the best body and is the sexiest in the group. – Hyejeong starred in FT Island’s “I Wish” MV. – She is originally from Busan, then her family moved to Seoul. – She was a famous ulzzang. – She auditioned for FNC Entertainment in 2009. – Her family was very supportive of her following her dreams, so they moved from Busan to Seoul in order to increase the possibility of her becoming a singer. – Her favorite school subjects were Math and Music. – She took on the role of Yoon Jin Young at KBS’s “Adolescent Medley” along with labelmate Kwak Dongyeon. – She loves eating, her favorite foods are chicken or pizza. – Mina is in charge of the laundry in the dorm. – Mina appeared in the dramas “Modern Farmer” (2014), “Click your heart” (2016), “Hospital Ship” (2017). – FT Island’s Jonghun once said that he is a big fan of Mina. – Her favorite artist is the Japanese band Mr. Children. – At the dorms, she is in charge of laundry. – Mina’s ideal type: Snoopy or Charmander. No double eyelids, looks friendly, likes her, doesn’t hide his feelings. – She was born in Bucheon, South Korea. – She wanted to become a singer since her school days when she was a part of a school club band that also taught her how to dance. – Then she was admitted into an arts-focused high school. – She plays piano since childhood. – She was a promotional model for one of her teachers while in junior high. 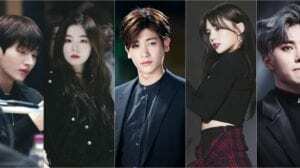 – Her friend advised her to compete in the Smart Uniform Model contest, where she met the current FNC Entertainment manager. – Before debut, she used braces. – She and Hyejeong eat the most out of the AOA members. – Seolhyun favorite sport is swimming. – She filmed more than 15 commercials in 2016. – Seolhyun have a mole on her tongue. – People often say she looks like a combination of Naeun (APink) and Bora (SISTER). – She starred in FT Island’s “Severely” MV. – She acted in the dramas: “Seo-Young, My Daughter” (2012), “Ugly Alert” (2013), “Orange Marmalade” (2015). 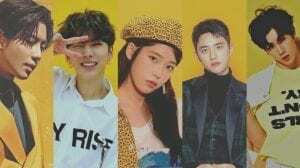 – Seolhyun was in a relationship with Zico from Block B, but in September 2016 it was announced that the couple had broken up due to personal reasons. – After ChoA’s departure, Seolhyun and Jimin have left the dorm. Seolhyun lives with her sister. – She was born in Gumi, South Korea, but at age of 6, her family moved to Daegu, South Korea. – She has an older sister and a younger sister. – When she was a kid she had lots of energy, so her mom sent her to a dancing school. – She has been scouted while she was dancing during a basketball game in the 2nd year of middle school. – She talks while sleeping. – Because Chanmi has many things on her bed sometimes they fell onto Choa’s bed since Choa and Chanmi share a bunk bed together. – In 2014, she made it into the final round of MBC Music’s Idol Dance Battle D-Style. – She acted in the web drama “What’s Up With These Kids?” along with VIXX’s N and Hongbin (2016). – Chanmi is involved in a personal performance project called “Look at Mi” (a dance performance project). – She was born in Incheon, South Korea. – She has dreamed of becoming a singer ever since she was a kid. – When she was in high school, she would practice singing alone at night. – She failed her auditions many times but she didn’t give up. – She had the opportunity to become a member of AOA when she accidentally bumped into Juniel in public and was advised by her to audition under FNC Entertainment. – Her parents opposed her dream to become a singer but then gave her the permission. – She left AOA on 22 June 2017, explaining that she left due to insomnia and depression. – She was the former drummer of Sponge Band. – She plays the drums since she was in seventh grade. – Youkyung left AOA in October 2016. 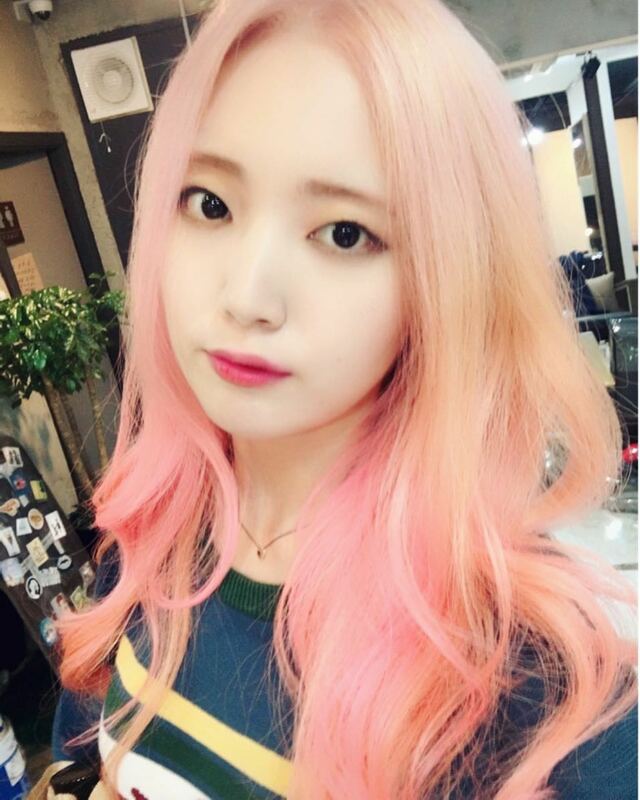 – After her contract with FNC Entertainment expired, she decided to leave the band. Which AOA member is your bias? i weigh 93-95 lbs and i’m 5’2″ and im pretty skinny! how do some of them weigh more and less than me! Yuna is my bias, she is so beautiful and looks like a sweet young woman. Her voice does sound like an angel! My bias is Hyejeong, but boy I didn’t know she was this popular! i like Y, her image kinda different but she no longer AOA right? Why no mentions of the sub-units? No problem, just one thing the second sub unit it’s actually AOA Cream (Hyejeong, Yuna and Chanmi), because AOA White it’s a non promotional unit. Nope. I read somewhere she said so herself on live games that she weighs 57kg which is a good weight for her height. i mean their profile. i read that korean consider you fat if your weigth above 50kg. its insane if you have height like hyejong who stand in 170cm (again in profile). Wow. Their standards are outrageous and unethical! Such a demanding culture. To be honest, I’m glad I’m not Korean. that why. i think most idol profile usually wrong. i read most idol weight profile mostly under 50kg no matter how tall tey are. they usually increase their height and decrease weight. yes, korean standard beauty is crazy (and scary). they adore white snow skin, v line jaw, tiny nose, big eyes. more or less like barbie doll. that why PS very popular there. only hyejeong the OFFICIAL visual.. and seolhyun is the FACE OF THE GROUP only eventhough she’s pretty. Could you update the photos to the Excuse Me teaser Photos? Can you make april profile? AOA never officially announced a color. I think Aoa official fan colour should be white. Bcz their concept is Angel. Angel is white, am I right? Just my opinion. I share the same birthday with Chanmi!!!! But I’m a 01′ liner so she’s 5 years older than me..
Ok since I’m a seolhyun and hyejeong biased, I found mistakes here for their height. Seolhyun is 170 cm. She said it in one of her commercial when she was behind the scene. And when they asked is she the tallest, she said that Hyejeong is the tallest and she is 174 cm. Sorry for my bad English. B4 this Seolhyun is a visual and hyejeong is a face of group……now its change??? yeah Seolhyun is the Face of the Group (she’s the most popular member and also the center in the majority of the photoshoots) while Hyejeong is the visual. Let’s give her love and support, Elvis! Ah everything will be strange for a while in AOA now that Choa left…..
ChoA was spotted at fansign after leave AOA, the event hosted by Italian sportwears Ellesse where ChoA contracted with. Followed by ChoA departure, Seolhyun and Jimin has leave the dorm. Seolhyun live with her sister, Jimin live alone. The remaining members still live in the dorm but look out for other living arrangements. 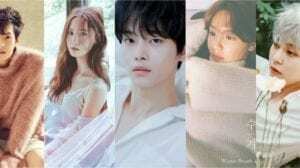 It was confirm that Seolhyun is the lead vocalist. I think someone is wrong on Mina’s lead rapper position. For example, even if jimin isn’t there, it’s always chanmi that covers her lines. mina doesn’t rap in their new songs anymore. So she is just a sub-rapper. do you have a proof for it? I read that Jimmy was on a show where she was at a school and they had an English lesson. her English was worse than the school kids, basically just a few basic words. and I do have proof. what about you? do you have any? but if you have a source, a video in which she speaks English fluently, please, do share. There are rumours that Jimin had a relationship with Jinhwan iKON. And Seolhyun also have a relationship with Zico from Block B but they already break up after 6 months I think. I am so sorry youre the one who is right cause I thought were talking about Jimin from after school club. I am so so sorry I think Im being too harsh on you. Im sorry once again. – Mina also appeared in dramas:”Wonderful Days”(2014), “All About My Mom”(2015), and “Queen Of Mystery”(2018). – She also appeared on music video of Shade’s “Bad” and Kangnam’s “Chocolate” with actor Nam Joo Hyuk. (Please show support for AOA) FIGHTING!!! 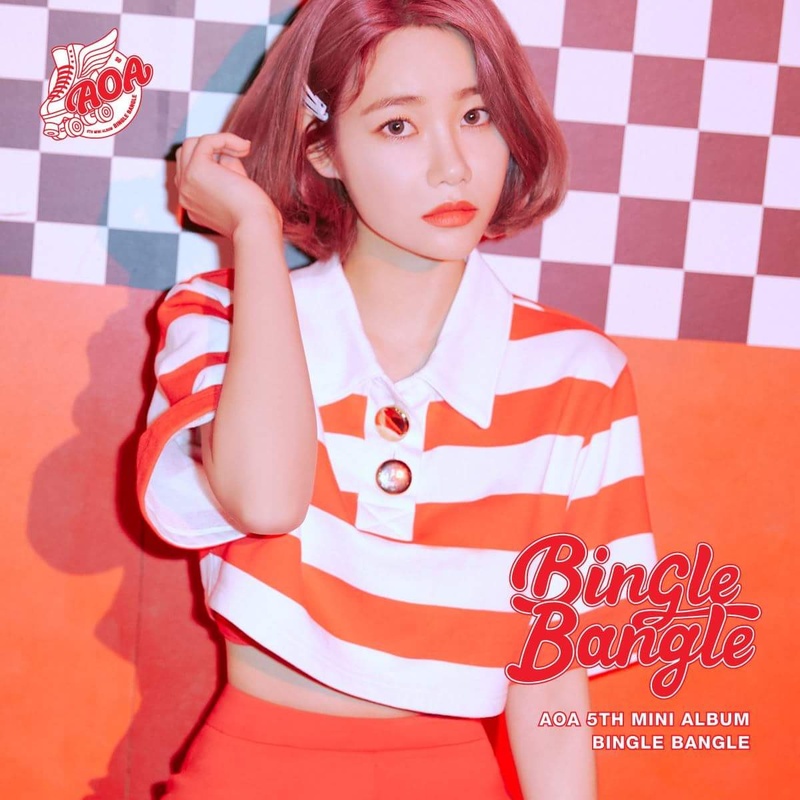 Having more lines in Bingle Bangle doesn’t suddenly make her a lead vocalist. She got way less in most side tracks too. And Seolhyun and even Mina are both stronger vocalists than Chanmi. and ChoA’s is @queenchoa_ but she deleted most of her posts. Yes, Seolhyun and Mina are definitely better vocalists than Chanmi. If you listen to them and watch lives of them, you can see why. Chanmi has the most underdeveloped voice. The only reason people seem to think Chanmi is better is because she’s “stable” and loud. She just has good projection, which is likely due to her training as a rapper. She still has a very underdeveloped vocal technique. Seolhyun and Mina have their faults as well, but they are definitely much stronger. One of Mina’s biggest issues is that she doesn’t have projection or much support so sometimes it just sounds like she’s mumbling when she’s singing. And I don’t understand why you’re in denial that Seolhyun is better than Chanmi or Mina. She’s had the biggest improvement of the three. She has developed much more strength and support. With more training, she could potentially be a lead vocalist. Plsss….make their individual sub-unit profiles…..
Can you please do a profile for the sub units AOA cream and AOA black? why is youkyoung only a half angel? It was part of their angel concept when they debuted. The group concept was that the entire group consisted of Angels and they were Aces (hence why they were named Ace of Angels), so they were a group that consisted of singers, dancers, musicians and beautiful women, which made them aces. And then they also broke up into separate units. They had the entire group which consisted of all eight members, and then they had different units which included AOA Black (the band unit), AOA White (the dance subunit), and AOA (the main promotional unit). The members that were in both the whole group AND the main promotional unit were considered full angels since they were in the group and its main unit so they were the ones constantly promoting and mostly attached to the AOA name and brand. 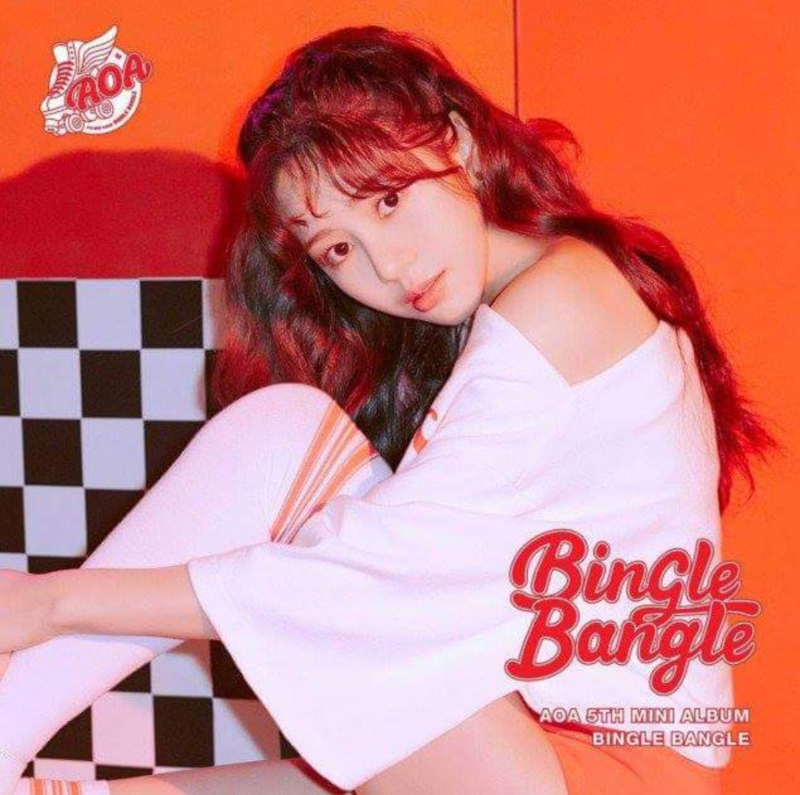 But since Youkyung was in the main group but not part of the main promotional unit and only in one of the sub units (AOA Black), she was considered a half angel since she only promoted when the subunit was active. I CAN’T BELIEVE SEOLHYUN IS NOT A VISUAL. IS THE COMPANY BLIND?? I MEAN LOOK AT HER COMPARED TO THE MEMBERS ( Not saying the others are ugly) But I think she’s the prettiest. Who is AOA girl crush? 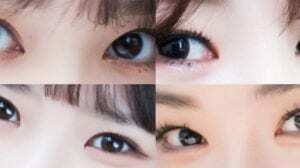 What is the difference of visual and face of the group? 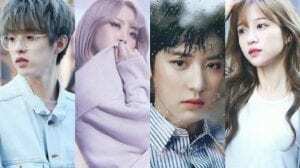 Can you please tell me what is the difference of the visual and the face of the group? So whats the center person of the group do , they lead all the dances in the chorus ? Whats the dif between the visual and the center? The center is the member who usually grounds the group. It’s the person who tends to stand in the middle quite a bit and whenever they’re in the center, the group seems to be the most complete. For example GFRIEND has a dual center consisting of SinB and Yerin, and WJSN has Bona. It is rumored that AOA will be disbanding soon. It’s everywhere around the media. 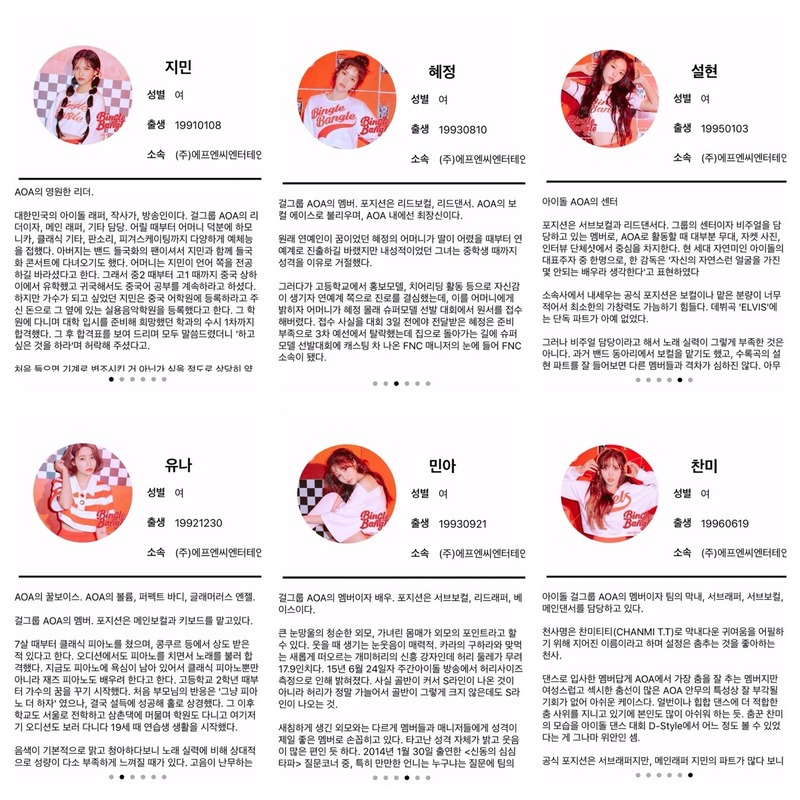 it is sad that im not seeing the AOA Cream members profile .__. There is a rumor going around that AOA might be disbanding in May. It is because a few of the members aren’t going to renew their contracts. Their contracts end mid-may, and as most of them are pursuing acting and other professions (and none have resigned with FNC), it is highly likely that AOA will end up disbanding. ANY NEWS ABOUT ANY COMEBACK PLEASE! ?!?!??!!!!! 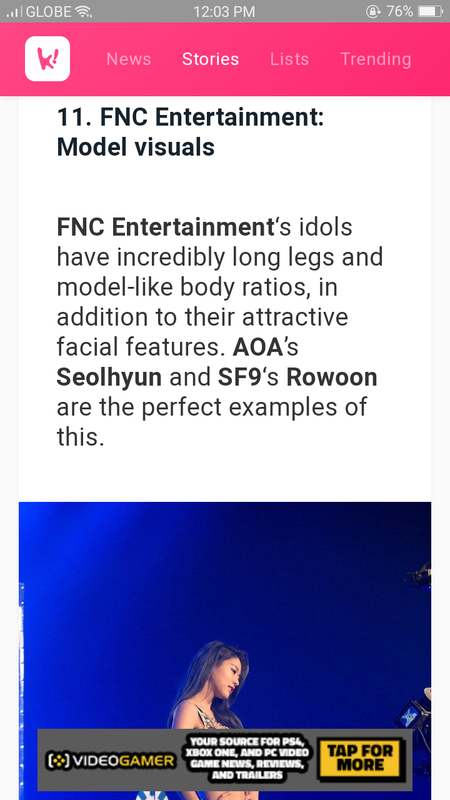 FNC’s official profiles for each of them on the app “fancity” say Seolhyun is the visual and that Mina is the Lead Rapper and Chanmi is a Sub Rapper. Hyejeong is not one of the centers. Seolhyun is the only center. During some group performances, Hyejeong and Chanmi are on either side of her because the three of them make up AOA’s dance line, which is why in the choreography in a lot of songs like Elvis, Confused, Bing Bing, etc. the three of them are sometimes in the center together, but Seolhyun is the only center.